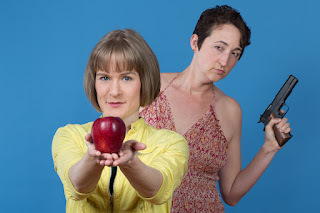 Cherry and Spoon: Fringe Festival 2016: "Apple Picking"
Highlights: In this hilarious dark comedy, mobster's daughter and hitwoman Candy (Mo Perry) brings her boyfriend Johnny (Jason Ballweber) to the family orchard to dispose of him. Red (Natalie Rae Wass) and Robert (Christopher Kehoe) appear to be on a date, but are actually undercover FBI agents. A mad chasee ensues, observed by a pair of trees (Rachel Petrie and Joshua English Scrimshaw, the funniest trees you've ever seen whether silent or speaking in a drug-induced halucination). It's really funny and the cast is fantastic, thoroughly enjoyable start to finish. Which is probably why it won the encore slot at 8:30 pm today.